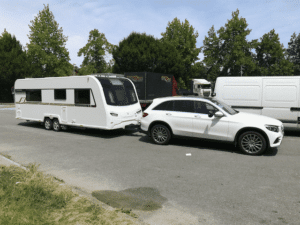 If you already own a caravan you’ll know the freedom it gives you to pack up all your stuff and get on the road and tour parts of the UK you might not have ever been to, or indeed might not have gone to without your trusty caravan in tow. I’ve written an article on this very website about the advantages of buying a caravan as well as somethings that I don’t like about caravanning However, on the whole it’s a very positive experience and you meet some great people (if you choose to). 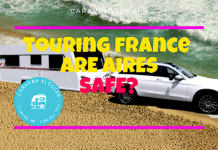 More and more people now are taking their caravans abroad. We’ve been going to France for a few years now and we absolutely love it. 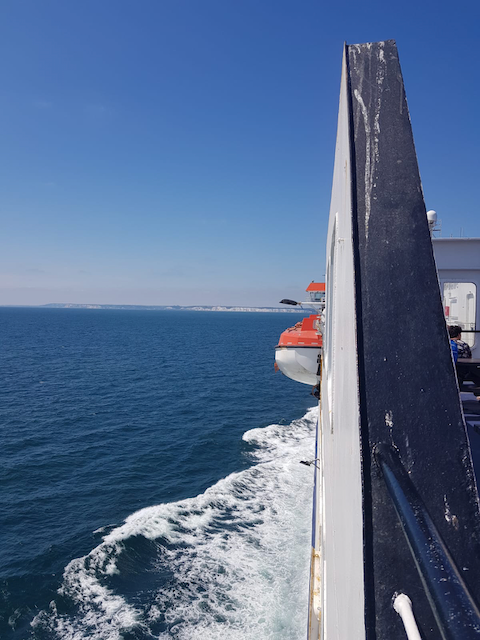 This article is about what we’ve learned on our trips and what you need to know about before you head off to either the Channel Tunnel or the Ferry. How Much Driving In One Day? 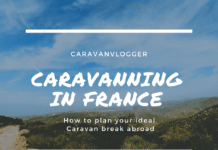 There are multiple ways to cross the channel with your caravan. You can go on either a ferry, or le Shuttle. 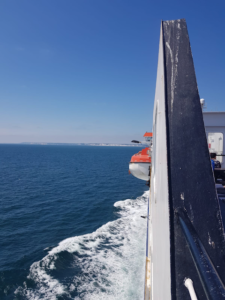 You don’t have to land at Calais, depending on where in France you’re going you could take a longer ferry and have less driving. You could even to down as far as Santander in Spain if you’re holidaying in Southern France. You’d need to take several things into consideration. The main thing for us, when we first started was having a dog. On the ferry you have to leave pets in the car whereas on the train you stay in your car with your pet. The trains crossing is quicker. Ferry takes 90 minutes, the train 35. You can walk about on deck, have some food and drink on the ferry. On the train you can sit in your caravan / motorhome. You can get out of if you wish. Our circumstances now suit the ferry better, we’re not in too much of a rush, we don’t have a pet and we quite like walking around the ferry. It can be a daunting thing getting a caravan on a ferry of you haven’t done it before. I’ve put together a short video showing you what to expect. Assuming you have gas on board, you need to switch your gas off at the bottle. We’ve been stopped and had it checked when using the train. This is a little like the chicken and the egg. Do you book a campsite first? If you do you might not get a ferry. Or book the ferry first and you might not be able to find a campsite. These issues are dealt with by making sure you book early enough. We’ve booked as early as before Christmas for the following years French holiday. This year we booked for the following year whist still on the campsite as we wanted to go back. This is a personal thing. 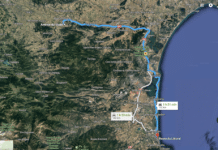 We drive down to the very south of France, which for us is about 17 hours driving in total from Calais. We take things easy, we use toll roads and stop at an Aire every few hours. So next year we are booked in at the campsite from Wednesday. We’ll get the ferry Friday night and work our way down, stopping at sites we will have already booked. We’ll leave the site also on a Wednesday and plan to get back Saturday. Also booking sites on the way back. 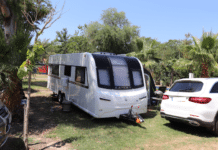 The Caravan and Motorhome Club have just added a lot of new sites in France. We probably drive about 5 hours a day, it’s possible to do more and you don’t have to book a campsite you can stop in an Aire, we have done this before. You can also stop at service stations. There are plenty of stories telling you about people being attacked, or gassed, I don’t really know what to think of these, but we’ve never had a problem. We have travelled to France with kids, ours are grown up now so we just take ourselves and this is an important point. We can take our time, we don’t generally ask each other if “we’re there yet”. If you have children, you might consider not going quite so far down into France, we do it to “guarantee” the weather. Driving through the night seems to be quite popular, getting on a campsite about midday, staying the day and go again the next day to arrive at your final destination. Don’t forget to check out out YouTube Channel and give us a subscribe, it’s free you know!